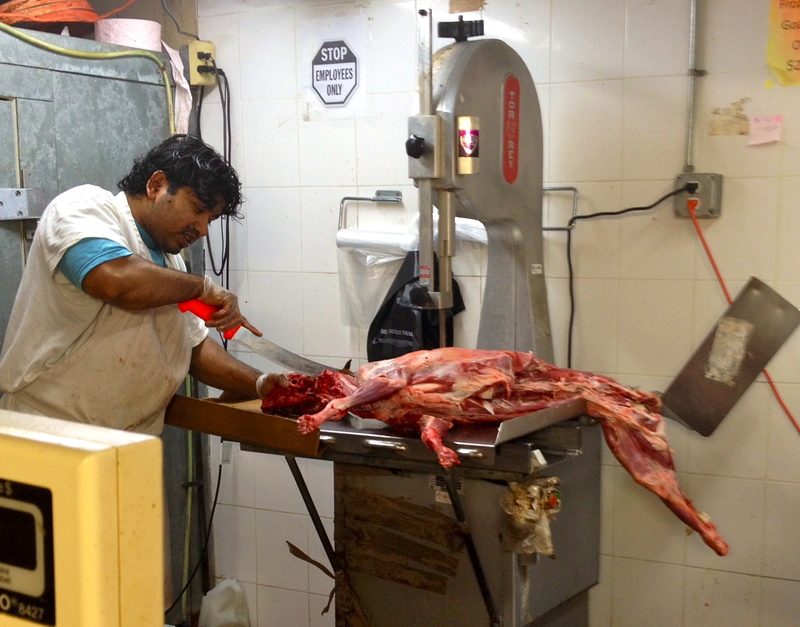 Meet Yusuf, the butcher at a Bangladeshi store in Cambridge, Mass. A skinned goat lies on the weighing scale. Yusuf Sheik lights a couple of incense sticks, but the potent smell of raw meat lingers. It’s 10 a.m. His 10-hour workday has just begun. Yusuf begins cleaning the stainless steel meat-and-bone saw. The first wipe itself makes the vertical blade shine. But Yusuf is not satisfied. He wipes it over and over again with a worn out piece of cloth. The machine is his aid; its razor-sharp blades glide through frozen meat and fish with impeccable ease. His next chore beckons. He walks toward the big silver walk-in cooler. ‘Employees Only’ reads the sign outside the cooler door. The thermostat needle points to 30F. He opens the door and walks in. Huge chunks of a variety of meats – beef, goat, chicken — hang from wood-colored metal bars nailed to the cooler walls. “We are not supposed to keep meat on the floor. If we do, a surprise visit from the food inspector could get us in trouble,” Yusuf says. Stacks of brown boxes lie on the cooler floor. He begins carrying them out one at a time. “We also store vegetables here overnight,” Yusuf says. The sound of footsteps distracts him. His first customer of the day has arrived. “I want a big fowl chicken,” says his first customer. “This big,” gestures the woman parting her hands widely. Yusuf walks into the cooler and brings out a chicken. He places it on the weighing scale. “Seven pounds. Is that OK?” he asks. He de-skins the chicken with his bare hands and puts it on the worktable of the meat saw. He turns the machine on. The droning sound of the machine drowns his voice. “Do you want me to cut it into big pieces?” he shouts at the top his voice. “Yes, and I would like the liver too. Do you have goat heads? I would like two of them,” the woman shouts back. Yusuf walks into the cooler and brings out a couple of goat heads. The woman, wearing a black skirt and a flamboyant top with floral prints, steps forward and gives him instructions about what part of the head she would like and what parts he could discard. “Pack the brains separately,” she says. He nods and turns on the electric saw. He packs the meat in a plastic bag and hands it over to the woman along with a piece of paper with the price written on it. The flight of wooden stairs will lead her to the cash counter upstairs. “Thank you,” says the woman and places a dollar bill inside the white tip basket, before walking away. “I make anywhere between $30-$45 a day in tips,” he says with a smile. The red brick exterior of the grocery store with its rectangular yellow board, with ‘FOODLAND’ written on it, is hard to miss. The board declares in bold black letters ‘BANGLADESHI, INDIAN & PAKISTANI GROCERIES’. The word ‘AMERICAN’ is also thrown in, in between Bangladeshi and Indian. Mohammed Jamal Uddin, the owner of the store, employs three men in the store. He owns another grocery store in Burlington. Once you push open the glass doors, with the store hours written on it, the strong smell of a medley of spices will punch your senses. Your eyes will be drawn to the pile of a variety of rice, packaged in colorful bags, forming a hillock. Just to the left of it the wall is lined with large freezers. They house a variety of ready-to-eat frozen exotic delicacies, like the Indian dessert Ras Malai, cottage cheese balls in thickened milk, and different kinds of flat breads. The store nestles a wide variety of items– from powdered spices to whole spices, vegetables to fruits, desserts to drinks, utensils to dress material. The colors and the smell combine to form an enticing atmosphere. But a very different world awaits in the basement. Just a couple of foot away from the cash counter are the stairs leading to the world of Yusuf, the store butcher. The red tiles on the basement floor have mostly faded; black patches show up here and there. The basement houses eight medium white freezers. Huge silver air conditioning ducts and black electrical wires run overhead. Large cardboard boxes holding spices are placed on the racks that adorn the walls of the basement, with dates written on them with black marker pens. The small red fire extinguisher adds a touch of color to this otherwise dull space. The sight and smell of different kinds of butchered meat and a variety of fish can be overwhelming for a first-time customer. But Yusuf seems nonchalant. Yusuf is 5’3”. A black mole sits on the right side of his cheek, just above his lips. His disheveled jet-black hair caresses his temple. He wears a white oversized shirt over a blue t-shirt and a pair of faded blue jeans. He has been working here as a butcher since he was 26. He is 35 now. It has been ten years now since he has moved to the United States from Bangladesh. His wife Aisha, an American citizen, had gone to visit Bangladesh in 1998. It is then that their families, who had known each other for a few years, decided to get them married. But Aisha had moved back to USA just a year after marriage. Yusuf joined her in 2003 when he heard that his wife was pregnant with their first child. His first job in the country was that of a waiter at a Pakistani restaurant. But the restaurant closed down few months later. His job hunt began again and he found an opening in Foodland and took the job without hesitation. Yusuf spends seven days a week here, confined to the basement. “It felt like being confined in a prison for the first few months. But I tried not to feel sorry for myself for that would make things worse. I have studied only till the ninth grade; job-wise I have limited options. I have a wife and five children to feed, I have no other options,” Yusuf says. Yusuf makes $800 a week. He pays $1700 for rent each month. But Yusuf always caters to his children — Sheik Abdul (14), Khadija Sheik (10), Yonus Sheikh (7), Johara Sheik (5) and Mahmud Sheik (3). “As a child I never got what I wanted. But I want to give my children everything they want. I want to give them a good education too, so that they do not end up like me,” he says. But that often means having no money left by the end of the month. “I did $600 worth of shopping during Black Friday sale for my children and wife. I also bought my children a PlayStation recently,” he says. “In the ten years that I have been in the US, the only luxury I indulged in was buying a fancy pair of shoes for myself,” Yusuf says. “I don’t want my children to look after me when they grow up. I will be happy if they can fend for themselves,” he says. Yusuf fears his children will grow up without learning to appreciate his culture. “But I am never going to force them to do things they don’t like,” he says. Yusuf makes it a point to send money to his aging parents back in Bangladesh. “I miss them, I miss home, I miss my friends. In these ten years I haven’t gone back to my hometown, Narail. When I feel depressed I always remind myself I have a family to take care of — both here and in Bangladesh,” says Yusuf. Narail is a small town in the south-western part of Bangladesh. The lush green fields, the sparkling ponds, and his friends, are the things that Yusuf misses most. “If I return to Bangladesh now I am sure I wouldn’t have to work so hard as I do now. But then again I won’t be making the amount of money that I make now,” he says. His second customer of the day arrives. Yusuf greets him with a broad smile. “How are you doing? What can I get for you today Shakhwath bhai (brother)?” he asks. “Four pounds of gosht (beef) and two whole chickens,” Shakhwath Lokma replies. Lokma, a regular customer, describes Yusuf as a “good hardworking man.” He hands Yusuf a $5 tip before he leaves. It is this hard work that often makes it difficult for Yusuf to say his namaz (prayer) five times a day, as ordained by Quran. “If I can do it only once a day then I make it a point to recite all the rakats (verses),” Yusuf says. He tries to visit the mosque at Alewife on Fridays. “Our religion also entails women to cover their heads all the time and also to wear burqa. My wife doesn’t wear one, and I don’t force her. This is a country where you cannot force anybody into doing anything,” Yusuf says. Yusuf refrains from drinking alcohol and consuming pork. “That’s what my religion says. But I do it because I have never been used to it. If my children grow up and choose to drink wine or eat pork I won’t stop them but it is definitely wrong and something I won’t like,” he says. Yusuf brings lunch to work every day. “I can only eat halal meat. That’s what our religion says. It is the way we cut our meat. We cut it in two strokes and take the name of Bismilla Allah (the name of God) before slaughtering the animal. The blood draws out of the animal and the meat turns out to be very tasty due to the process we employ. The halal process ensures that the animal encounters very little pain,” he says. He also keeps the month long fast during the holy month of Ramadan. “I eat before sunrise and then again after sunset. It is difficult but that is what we have been used to as a child,” he says. It’s almost 9 p.m. It’s time for him to clean up his workstation and mop the basement floor before he leaves for the day. He is visibly exhausted. Jamal Uddin will give him a ride back home, to Everett. Almost all his children are asleep by the time he reaches home. “I take a long shower and cook for myself. I am tired of the burgers, pizzas and sandwiches that my wife cooks. I buy gosht from the store and cook some gosht curry, dal and rice along with it. I watch TV and relax,” he smiles. His day begins at 6 a.m. He helps his older kids to get ready and walks them to school. Jamal Uddin will give him a ride to the store, as he does every day. Jamal Uddin parks his car right in front of the store. Yusuf can see the words ‘FOODLAND’ clearly now. Categories: Uncategorized | Tags: bangladeshi boston, bangladeshi store boston, butcher cambridge, butcher woodland, foodland cambridge | Permalink.